27 cuddly stuffed animal patterns that are sure to bring out the child in anyone. Cute designs of pigs, giraffes, horses, teddy bears, crabs, kitties, ducks, donkeys, snails, elephants, a seal, a mouse, and a toucan. 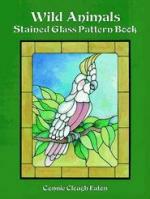 Each pattern is shown in full color & color suggestions are included. Designs can be used in panels and free form projects. A 26 window panel personal journey of a San Francisco artist. Patterns that have been designed and rendered by the artisan include a simple artist palette, horse in a field, pelican, parrots, sea turtles and more. All of the windows are shown in full color. Features exotic flowers, birds, and wildlife. Small panels and light catchers include tree frogs, parrots, a gecko and florals galore. Some of the designs can be adapted for matching fan lights. 36 pages, 4 pages shown in full color. 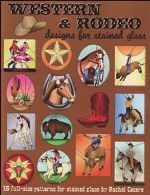 15 assorted western and rodeo designs. Themes include: long horn, bull riders, square dancers, buffalo, boot, cowboy hat, several horses and more. Use as sized or enlarge the designs to fit your window. 34 patterns shown in full color of cats (both wild and domestic), and birds of all types. 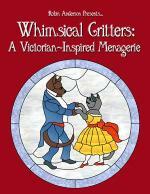 Designs include kitty cats at play, lazy cats, cats getting into trouble, blue birds, ducks, swans, owls, woodpeckers, cardinals, and blue jays. Includes a flying pig to finish off the portfolio. 28 panels & suncatchers of North American animals in the wild. 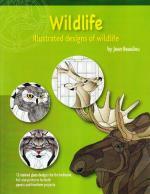 Patterns in include a deer, bears, squirrels, eagles, a coyote, an owl, a snake, a raccoon, a lion, and more. 36 pages, 4 in full color. Remarkably rich collection of 60 full-page designs featuring such wildlife favorites as the antelope, cougar, giraffe, koala, elephant, lion, deer, otter, eagle, duck, parrot, hummingbird, many others. 12 patterns of different animals in the wild. Designs include eagle, stag, owl, lynx, moose, fox, wolf, raccoon, bear, squirrel, falcon, and a puma. Patterns are detailed head shots of the larger animals. Each pattern is shown in full color and color suggestions are included. Designs can also be used in panels and free-form projects.